Spectacular Death has been spending quite a bit of time since October, running Ulduar to gear members up for attempts to get the Herald of the Titans achievement. With this achievement, the toon cannot be over level 80, nor can its gear be over ilevel 226 or weapons over 232. The battle is hard and one extra best in slot piece can add just enough to help push the group through. If you skipped Ulduar, the fight starts at the formation grounds. You pick up vehicles and move across this area to the location of the first boss, Flame Leviathan. You had three machines you could ride; a motorcycle, a siege engine to the left, or these siege demolishers on which most of us are riding. Each had strengths and weaknesses. 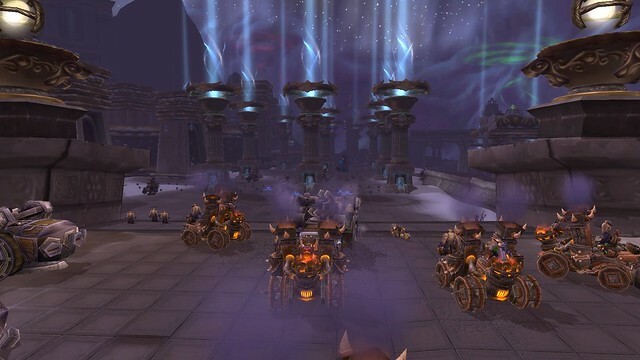 At the time Ulduar was released the idea of mounted combat was very new to the game. The talk was that if this took off, Blizzard would consider adding more mounted combat. From the start of Wrath of the Lich King, you could ride siege engines and demolishers in the hugely popular Wintergrasp battleground. Ulduar would just continue that, but put it against actual foes and not a stationary building. Alas, more people hated it than liked it. I remember reading there had been data-mined a vehicle combat in Icecrown but that was quickly scrapped when the player base overwhelmingly complained about these machines. When taken with the Argent Tournament jousting dailies, players took to the forums en mass to protest. They hated mounted combat. Personally, I like the machines of Ulduar. I think the whole raid suffered from the arrival, too soon after Ulduar was released, of Trial of the Crusader, which is a faster, more contained, raid. Why spend 2-3 nights here when you could spend 2-3 hours and clear a place with better gear? As we formed up for yet another run, we were ruminating about all these points. I'm not the only person who likes this first encounter. Kegenstein took the idea further and proposed a demolition derby style event. You'd ride engines like the demolishers. You could go solo or with a friend. You'd need to clear the towers off the battlefield, getting a point for each tower you topple. Once the towers were down, it was head-to-head with an opponent to destroy their machine before they destroyed yours. You could play with a friend, with the computer or with a random player. You could also group up and run a 5-man even just like arena, but with tanks. We like the idea of getting to ram other players or computerized players. As with Ulduar, there could be 3 types of machines. You'd need to score a win in all levels of play to get a mount. We're not sure what the mount would be. Your own personal siege engine would cause all sorts of anger when some griefer parks his on top of the mailbox or quest giver. Plus, they don't fit in the door of any building, but you know people will try. The way around that is to make the no mount zone we've seen on Khadgar apply to quest givers and mailboxes. Would you also receive honor as you do with PvP since the ability to play against other players is there? That seems to be a logical reward. So that's today's suggestion. Would you participate in a demolition derby-style event if Blizzard put it into the game?